Product prices and availability are accurate as of 2017-09-29 10:35:46 EDT and are subject to change. Any price and availability information displayed on http://www.amazon.com/ at the time of purchase will apply to the purchase of this product. 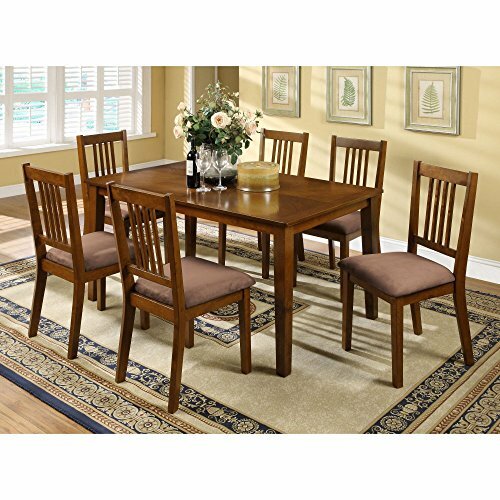 A timeless take on transitional design, the Furniture of America Iovita 7 Piece Dining Set makes any home feel more like home. 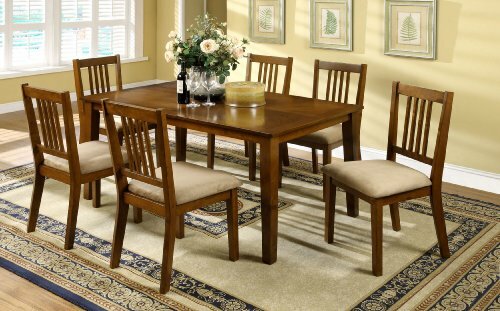 Wood solids and veneers are finished in a dark oak tone, while padded fabric upholstered seats add extra comfort. Best of all, the chair backs sport an eye-catching vertical slat design that's oh-so-easy to love. Dimensions:Table: 60L x 36W x 30H in. Chair: 17.5L x 20.25W x 38H in. ; Seat height: 19.25 in. Based in California, Furniture of America has spent more than 20 years establishing itself as a premier provider of fine home furnishings to urban-minded shoppers. The people behind the brand are moved by passion, hard work, and persistence, and their company's mission is to design the latest piece and offer high-quality furniture to trendy shoppers without compromising packaging integrity. Furniture of America offers unique, coordinated, and affordably designed furniture - not to mention exceptional style. 7-piece dining set with seating for 6. Wood solids and veneers. Dark oak finish. Padded fabric upholstered seat. Vertical slat chair backs.